EY is one of the four largest professional services networks in the world, together known as the “Big Four.” For a long time, the professional services industry was viewed as traditional and conservative, with the first professional services provided by legacy firms more than 110 years ago. However, it is undergoing fundamental changes today – the digital disruption poses challenges to all industries, and the professional services sector is no different. More than 20 years ago, I was introduced to the Sophists Aristotle, Socrates, Euripides, Plato, and Protagoras: The first lawyers of the world. The rapid development of technology and its impact on our daily lives can be witnessed in everything we do. From e-commerce to remote control of the temperature at our homes, technology has changed the way that we manage our daily tasks. Similarly, in the legal industry, technological developments – from advancements in standard legal tasks to big data analytics – are all taking center stage in the work being done to improve the provision of legal services. The accelerating shift from traditional on-premises information technology (IT) systems to cloud computing presents in-house counsel with a veritable obstacle course of compliance challenges and regulatory pitfalls. Virtually every industry today faces an expanding set of data security demands, while different countries often have their own unique privacy and data protection requirements. I have been working for Tesco for almost eight years, and when I joined the company, “compliance” was absolutely not a focus. We certainly followed values like “no one tries harder for customers,” but we did not know too much about compliance and about how important it should be for a well-organized company in the 21st century. 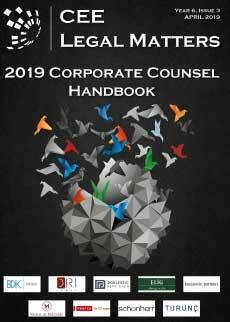 The role of the in-house legal counsel in recent years has become intensely intermingled with compliance matters, which are of huge importance for international corporations. For example, American companies place great importance on anti-corruption compliance, and the U.S. Foreign Corrupt Practices Act is widely known and complied with in Europe due to its extraterritorial application. It is good to have at least general idea of the answer to the question of where the added value of the legal department lies, otherwise you might become a very expensive administrator whose contribution to a company success is questionable. The rapid transformation (one could almost say the revolution) of the world of legal services is a fact and has been taking place for some time now. In fact, I believe it is now gaining its full momentum. This transformation affects both law firms and in-house legal departments. It started several years ago with cost-cutting, as clients expected more and more for less and less: in-house legal departments from external law firms, and internal clients from in-house lawyers. More changes followed. The legal department is one of the support functions in an organization which is, or at least should be, constantly evolving together with the organization it supports. It cannot be too static or too inconsistent in its approach and way of handling the organization’s legal matters. The method of providing legal services has changed a great deal over recent decades. This is true both globally and in CEE, which has been integrating rapidly into the global economy. In this process, local subsidiaries in the region have absorbed key trends and practices from their Western headquarters, business processes have upgraded and developed, and business itself has become more cross-bordered and technologically advanced. Years ago, when a group of in-house lawyers entered the elevator of a bank, someone would mock, “Wow, what a bunch of handbrakes!” While this did not personally happen to me, I am well aware that internal legal counsels are often referred to as “problem factories” or “speedbumps” – the couriers of bad news, best to be avoided. I must admit, this scorn was not without reason. But, should this necessarily still be the case? In my view, not any longer. In the 18 plus years I have been an in-house counsel I have had the opportunity to observe the evolution of that role. These days, in-house legal counsel do more than simply review contracts and provide legal counseling. We are no longer transactional clerks who merely approve what has already been done. General Counsels have evolved from being purely legal advisors to being strategic advisors. It is not enough now merely to provide guidance and business solutions on specific issues or resolve disputes that may arise. We must be forward looking business partners, seated at the table at which strategic decisions are made. The phenomenon of globalization has impacted almost every field of personal and business life of this generation – and the position of Head of Legal is no exception. In order to understand the evolution of this role compare what football or basketball looked like 30 years ago to what they look like now: Almost like different games. Martin Strnad has been the General Counsel of Y Soft – A Czech Software company headquartered in Brno, with offices in ten countries – since March 2016. He was previously an Attorney with Havel, Holasek & Partners and a Managing Associate with PwC Legal. Earlier still, he was a Clerk responsible for drafting bills of law and assisting in the preparation process with the Legislative Office of the Czech Ministry of Interior. We first spoke with Pawel Stykowski, the Head of Legal at InterRisk in Poland, two years ago, in the December 2014 issue of the CEE Legal Matters. We decided to follow up with him now to see how his role and expectations have changed in that time. Vladimira Jicinska is the Head of Legal at AHOLD, responsible for the Czech market. She first joined the company in December 2012 after spending a little over two years in China working as the Head of Legal and Compliance of Home Credit China. Before that, she worked for AAA Auto holding for nine years, initially as an Acquisition Lawyer, and later as the Group Legal Manager of the company. Based in Ankara, Bora Kaya is the Managing Legal Counsel at Gama Power Systems Engineering and Contracting, a company that he first joined in March 2015. Prior to that he was the Head of Legal at Ronesans Holding from October 2012 to December 2014. Earlier still, he worked for Eregli Iron and Steel Works Co. as the Assistant to the Head of Legal Department.